With a good range of features for a modest price, the TP-Link TD-W8970 is a best buy. It features an ADSL2+ modem, 300Mbps Wi-Fi (albeit not dual-band), Gigabit Ethernet, and it even has support for 3G. Its interface is clean and quick easy to use for the most part. Our only issue is with the USB storage ports, which could use better functionality. TP-Link's TD-W8970 is an all-in-one modem-router that represents excellent value for money. It's an 802.11n wireless router with a built-in ADSL2+ modem and there is a four-port Gigabit Ethernet switch thrown in for good measure, as well as support for 3G mobile broadband. It doesn't feature dual-band Wi-Fi, and its network storage support could be better, but for around $99 it's a unit that can't be passed up if you want a reliable and well-performing all-in-one solution. One of the most impressive aspects of TP-Link's TD-W8970 is its Web interface. It looks attractive and it has a clean layout that makes its information easy to locate. Furthermore, it's a quick interface that implements configuration changes almost immediately. For its initial configuration, the built-in Quick Start option can be used to enter your ISP login details and your preferred wireless networking settings. The modem detected our ADSL2+ settings (connection type and VPI/VCI values) on its own, and all we had to do was enter our username and password. We were connected in no time at all. The wireless network can be enabled and disabled via a physical switch on the rear of the router, and we found this to be switched off by default. This meant that the wireless networking portion of the Quick Setup was greyed out. We had to switch it on before we could enter our own SSID and encryption settings. Applying the settings didn't require a restart. We won't even complain about the security settings being on a separate page to the basic settings — the interface was so fast we didn't have to spend any time waiting for one setting to take effect before moving on to the next. It really is impressive how swift and well laid out the interface is on this TP-Link router. It's conducive to making you want to check out every last feature because you know you won't have to wait any time between mouse clicks. The router's Status page is the first thing that's listed in the interface, and it gives you a quick glance at the particulars of the ADSL modem's speed, your external IP address, and your wireless settings. The Web interface is laid out nicely and it responds quickly to changes. Moving down the list, there is an option called Operation Mode, which hints at the versatility of this unit: it can be used as an ADSL2+ modem-router, purely as a wireless router without modem functionality (so you can plug in your own), or as a 3G router to distribute a mobile broadband connection through a 3G USB stick. This is one of the few settings that requires a restart of the router if you change anything, and it takes well under one minute to complete. You don't have to change the mode of the router if you want to make use of 3G though. Like other recent routers that we've seen that also support 3G (such as the Netcomm NF2 and the Billion 7800VDOX), this one can also be used to enable a 3G modem as a backup connection in the event that the main Internet connection goes down. You just get more control over the connection if you use the 3G Router operation mode exclusively — such as the ability to connect and disconnect the 3G connection manually. When using 3G backup in ADSL2+ mode, the mobile connection will switch on automatically so that you can continue to work online seamlessly. To test the 3G capability, we plugged in an Optus HSPA USB stick and used an iiNet SIM card to get on the Internet. There are two USB ports on the rear of the router and either one will work for a USB mobile broadband modem. 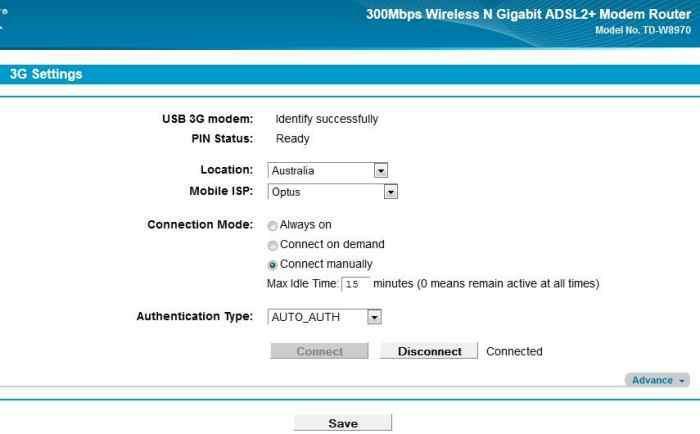 After plugging in the stick, all we had to do in the settings was select the country and the mobile operator (Optus) The APN name setting was not required — the router already had this information. There is support for 3G USB modems, which can be useful during times when your main Internet connection is down. 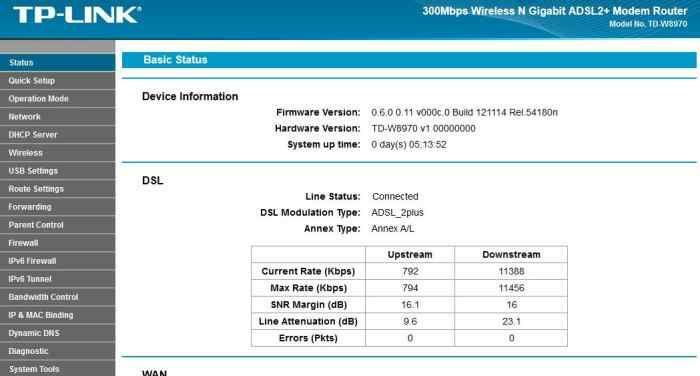 Using the ADSL modem, our ADSL2+ connection from iiNet remained solid throughout our test period. We didn't experience any drop-outs or slow-downs in performance, and the upload and download speeds that the modem achieved were on par with our expectations. The Wi-Fi module in the TD-W8970 only runs in the 2.4GHz band and it too proved to be a reliable performer in our tests. It put up similar results in our short-range (2m) and mid-range (10m) tests, recording a transfer rate of 12.48 megabytes per second (MBps) from 2m away, with only a slight drop off to 12.2MBps from 10m away. As far as 2.4GHz networks are concerned, these results are very good. They are better than the ones put up by other routers we've seen recently, including the Billion 7800VDOX and the Netcomm NF2, and the TP-Link also outclassed the Linksys EA6500 from the mid-range distance. How it performs in your own environment will vary depending on the level of interference from other devices and any physical obstacles that can hinder the wireless signal. For us, it proved to be a good unit for streaming video files off our desktop PC to a Smart TV located at that mid-range distance. We had no problems playing standard- and high-definition files for long periods of time. Additionally, we didn't experience any noticeable stuttering when accessing ABC iView and SBS OnDemand content wirelessly through the Smart TV's interface. There is a function that allows the TP-Link to share a USB storage device across the network (in addition to a printer), but it's a function that didn't work well in our tests. For example, while the router was picked up as a DLNA device and seen by our Smart TV, the contents of attached storage device, whether they were Fat32 or NTFS formats, were not readable by the TV. Furthermore, to access contents off the attached storage devices through a Windows PC, we had to enter the IP address of the router into the Location bar of a Windows Explorer window. We were able to create shortcuts to folders though, for quicker subsequent access. The fact that contents couldn't be accessed easily through computers, and not at all by the TV that we used for testing (an LG 32LM6410), is one of the only negatives of this router. There is a media serving function built in, but it did not work properly with our Smart TV. The good thing is that you can easily enable the FTP service in this router to remotely access data from a connected hard drive. The Web interface reports the IP address you need to use, which will be necessary unless you set up a dynamic DNS account. In our tests, the FTP function worked well, allowing us to log in to a drive remotely (from the office to our home set-up) and to download files at the maximum speed of our ADSL2+ connection (73 kilobytes per second). Up to five user accounts can be created to access the drive via FTP, and their privileges can be edited. Other features of the TP-Link TD-W8970 include a built-in firewall, parental features such as URL filtering, QoS bandwidth control, and VPN support. Physically, it's an interesting-looking router with slight curves and angles, it uses green status LEDs rather than uncomfortable blue ones, and it has three conspicuous antennas on the rear. You also get a power button, a Wi-Fi switch and a WiFi Protected Setup (WPS) button, although we would have preferred this to be on the front. As far as all-in-one budget routers are concerned, this one is among the best, if not the absolute leader. Not only do you get a built-in ADSL2+ modem, 300Mbps Wi-Fi and Gigabit Ethernet, you also get support for 3G mobile broadband USB modems and you can also use it to plug in a cable or fibre modem. It was a reliable unit throughout our test period and we also found it easy to set up and use. We just wish its media serving function played nicer with our Smart TV and that attached USB hard drives were easier to access through Windows computers. Still, it's a great buy and well recommended for under $100, unless you need a wireless router with dual-band capabilities.